Reh, a ritual festival of Idu Mishmi tribe which earlier celebrated individually started celebrating at community level as a reform to avoid huge wastage of wealth. 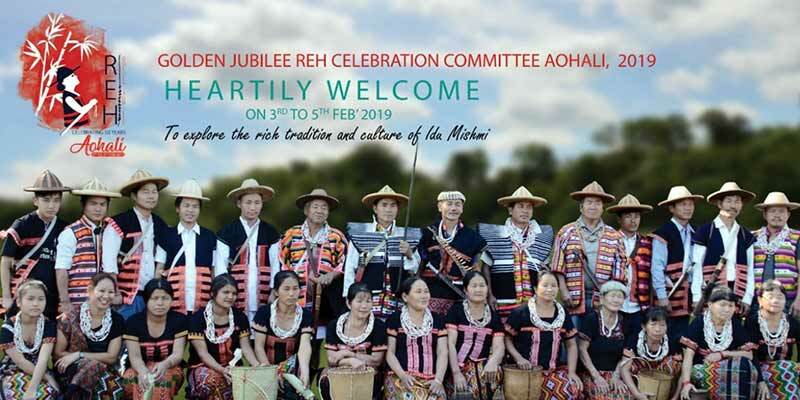 Aohali situated at the scenic foothills of East Siang dist observed Golden Jubilee Reh with much spirit and traditional gaiety. Festival revellers from Dibang & Lower Dibang Valley and Lohit enthusiastically participated to showcase their rich cultural heritage. Young & elderly person, men and women clad in their colorful embroidery attire in showcasing their richness. Basa Linggi Gaonbura Aohali while putting light to the mythology has made earnest appeal to each one of the community to bring reform in the mode of celebration. The sources said in the community highest number of 500 (five hundred) Mithuns were sacrificed by an individual which is a record. While imploring the youngsters about the dying culture, Agriculture Minister Dr Mohesh Chai as a chief guest in the occasion said festival is a trade mark of a community which steadily and gradually disappearing amidst the influence of westernization and fast modernization. “The Arunachal 26 tribes are critically in an endangered state as per the UNESCO survey report. The presence state govt. has resolved to implement local dialogue as third language in school from next academic session to promote vanishing culture”, he informs. Local Legislator and Adviser to CM Lombo Tayeng as a guest of honour express his assimilation to Idu tribe maintaining true sense of brotherhood in between Idu and Adi since time immemorial. The MLA also appreciated the unique fabric of the tribe that attracts lots of tourist from abroad. He also promised to extend all development packages despite paltry population. Recalling the history of Idu population at Aohali, Laeta Umbrey former MP – MLA and as chief Patron of AGJRC said Idu and Adi have maintained age – old relationship. He spoke on some of the democratic practice of Adi tribe which the Idu still follow. “The Idu is settled at the village since last 25 generations and its shrinking population is multi – prone factors including migration to Dambuk and Roing”, discloses the Umbrey. Unveiling of Reh Heta audio album, hoisting of Reh flag by the chief guest, mesmerizing modern dance and local numbers from melodious voice of Rigi Mekhu, Rajiv Mena and Sokhep Kri Director Gazetteers enthralled the revelers and guest presence on the festivity. Meanwhile, member from CALSOM, IMCLS, MWS and AMSU from Lower Dibang Valley and Lohit also joined in the celebration.